This was the other Harryhausen film which I watched (actually rewatched, in this case) in the run-up to our conference in November. Last time I saw this film, I had not yet seen Clash of the Titans, so one of the main things which struck me this time was how much of Jason anticipates things which are later reworked or built upon in Clash – and indeed which I’ve commented on from a Clash perspective in my review of that film. 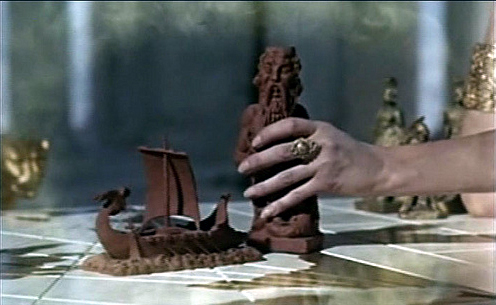 The meta-referentiality in the portrayal of the gods is one obvious overlap, since both films depict the gods controlling little figurines which represent the mortal characters and their monstrous adversaries – just, of course, as Harryhausen controlled his models on the animator’s table. But where Clash emphasised the link with dramatic story-telling by having its Zeus place his figures specifically in a theatre, Jason instead casts the gods as game-players on an epic scale, who move pieces around on a board. This board is nothing less than the world itself, complete with seas and continents, and it reminded me very much of Risk – which was apparently released in 1957, so could potentially have been a direct influence. Certainly, the adversarial nature of the game, in which Zeus and Hera are competing with one another for dominance over mortal affairs through the figure of Jason, matches up quite nicely with the goals of the players in Risk. At our conference, Stephen Trzaskoma showed in a brilliant paper how the theme of game-playing extends well beyond the board of the gods, casting Jason too as an active player (as when he holds games of his own to select his Argonauts, or ‘plays’ his Triton amulet in order to pass safely through the Clashing Rocks), and using the metaphor to explore the nature of the gods and their relationship with mortals. I’m really looking forward to the final version of Stephen’s paper for the full write-up of his thinking on this theme. Clash‘s portrayals of epiphanic encounters with the gods have their origins in Jason, too. Clash showed us Thetis inhabiting her own statue in the temple at Joppa, just as Hera had earlier spoken through her figurehead in Jason. 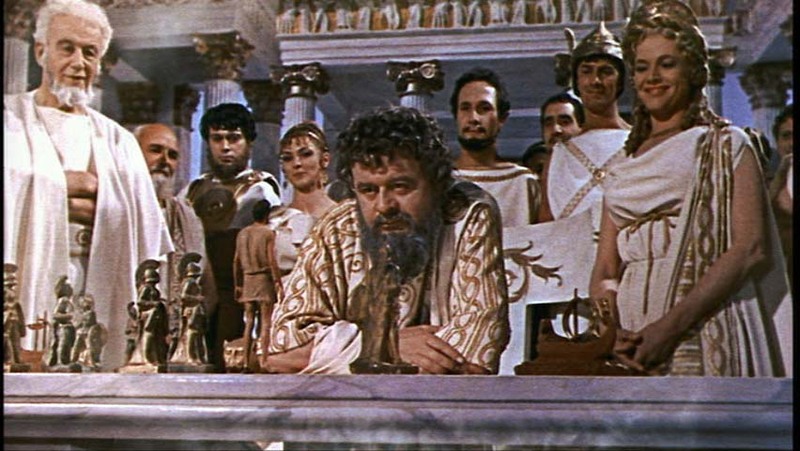 In fact, direct encounters between mortals and deities are frequent in Jason, with Hera also appearing as a mysterious veiled figure within her temple at Thessaly, and Mercury in the guise of an old man in the ruins of his own – to say nothing of the scene in which Jason is actually taken to Olympus and speaks directly to Zeus and Hera. As I noted when writing about Clash, all of this draws profoundly on ancient conceptions of the gods and their interactions with mortals, as understood in religious ceremonies, depicted on vase-paintings and described in mythological stories. 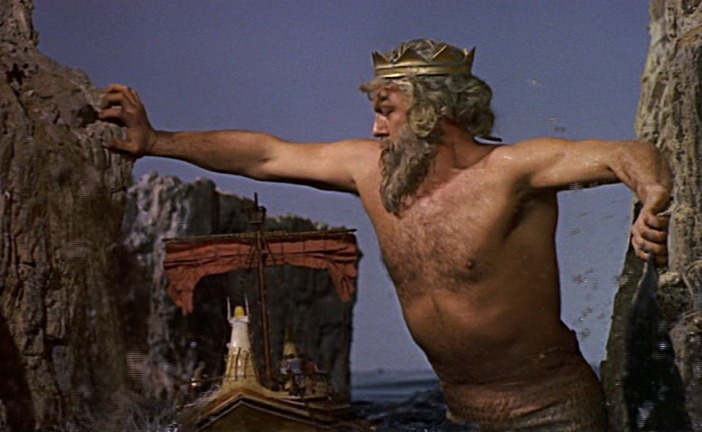 And it is perhaps a little meta-referential too, reflecting Harryhausen’s ability to breathe a sort of divine life into his models just as the gods animate their own statues. Then there are ruins as ruins – something I’ve noted now not only in Clash, but also in 20 Million Miles to Earth. Ruins in Jason do much the same job as in Clash of giving the world we are experiencing its own temporal depth, suggesting that centuries and centuries worth of struggles between mortals, gods and fantastical creatures have occurred before we even came in. In fact, the very same half-ruined temples at Paestum which helped to lend Medusa an air of the ancient and dreadful in Clash also crop up in Jason, where they set the stage for the attacks of the harpies on the blind king-in-exile Phineas. Here, they are cleverly worked into the action of the story by forming a ‘cage’ which allows the Argonauts to trap the harpies. But I also felt that they added an extra dimension to the figure of Phineas, echoing his ruined eyes and hunger-ravaged body, and perhaps also the ruinous relationship with Zeus which led to his exile and punishment. Certainly, the ruined temple where Jason encounters Mercury earlier in the film definitely does signal a dysfunctional relationship between negligent mortals and gods whose temples are left untended. And in this case, its ruinous state is definitely a conscious choice, rather than a necessity imposed by the use of real surviving remains, since although modelled on the temple of Athena at Delphi, it is clearly a set – so could have been reconstructed whole if that had suited the story better. And there is the feeling that, like Clash, Jason is essentially an SF film. The quest format goes a long way towards creating that feeling, simply because it so closely mirrors the conventions of the ‘voyage into space’-style SF story. To the modern viewer, Jason’s visits to various islands and kingdoms, complete with fantastical creatures to battle, princesses to rescue and hardships to overcome, feel a great deal like (for example) a series of Star Trek episodes in which the islands are simply replaced by planets. I felt that Medea’s outfit in particular, with her sparkly technicolor make-up and shiny futuristic-looking dress, really added to this impression, making her look for all the world like a Space Princess. As for differences, the most striking one for me was the costume and set design. As I’ve said before, the design of Clash is very eclectic, with costumes and architecture from a range of places and periods mingled together, creating a sort of Otherworld feeling and emphasising the fantastical-mythological nature of the story. In Jason, the emphasis seems to be more on designing each setting fairly consistently, so that the contrasts between them convey the changes of location clearly. Thus, Jason’s homeland Thessaly is characterised by Archaic and Classical (i.e. roughly 7th to 4th centuries BC) Greek design, with the male characters wearing armour like that seen on black-figure vases, and various Classical-style temples dotted about the plcae. But Colchis, where the Golden Fleece is located and where Medea lives, is all Persian-Babylonian, with the men in ringleted curls, reliefs of winged lions and columns painted in bright oriental designs. This has some historical rationale behind it, given that Colchis did operate under Persian control for a while, but more importantly it lends a properly epic feel to Jason’s voyage, carrying him beyond the confines of the familiar Greek world and into a visibly different exotic eastern realm. The model-work is, of course, enchanting throughout, and again all of the papers at our conference very much demonstrated the incredible influence that Harryhausen’s creations have had over the popular imagination. Everyone remembers Talos and the fighting skeletons, although I must confess to feeling a little underwhelmed by the Hydra. I get how difficult and impressive it is to animate a creature with nine heads and two tails – but the unique selling point of a Hydra is that if you cut off one of its heads, another one grows back in its place. Jason doesn’t cut off a single head, simply stabbing it in the heart instead, which felt like a bit of a cheat. In the end, though, my absolute favourite creature in the film is not an animated model, but the giant Triton who holds apart the Clashing Rocks so that Jason and his crew can sail between them. I simply can’t imagine a better depiction of a sea-god than this. I love the rivers of water cascading from his greying hair; his chubby yet supernaturally strong body; his slow-motion movements; the sheer elemental power with which he wrenches back the rocks; and the real feeling of weight as he plunges back down beneath the waves afterwards. He conveys the raw, unpolished, untameable power of the sea really effectively – and I think it adds a great deal to this impression that he doesn’t talk like the other gods, but simply turns up, demonstrates his brute strength, nods and vanishes again. Rather sadly, I found while looking for images of him that the actor who turned in this brilliant performance is not only uncredited in the final film, but now not even reliably identified. But whoever you are or were, Triton man, thank you for your most fantastic sea-god. This entry was posted on December 22, 2011 at 11:39	and is filed under classical receptions, films, greek mythology, ray harryhausen, reviews. You can follow any responses to this entry through the RSS 2.0 feed. You can leave a response, or trackback from your own site. Sorry I missed the conference. I must re-watch this film, as I can barely remember it – and certainly hadn’t remembered that Medea is dressed as an Orion dancing girl! It’s great – I enjoyed rediscovering it very much. I probably hadn’t seen it for about ten years, so had forgotten a lot, but it’s very captivating, and stronger than Clash overall, I think. Interesting piece, that I will surely return to when writing up my paper. I agree that Medea, especially when made up, looks like she could have come out of and episode of Trek, and I can see many other resonances. (For instance, I suspect Alexander Courage is more than a little influenced by Bernard Hermann’s score). But then the whole notion of the voyage to fantastic worlds does in the end go back to Odyssey 9-12 and the Argonautica, via the likes of Swift, Cyrano de Bergerac, etc. This isn’t quite the false divide I was talking about – I was specifically drawing attention to the unreality in some people’s eyes of the division between Greek mythological movies and those drawing upon other mythologies. But the divide between sf and fantasy is exactly the same sort of divide – it’s very important for scholars and fans, but I suspect most producers see little significant difference between, say, a fantasy movie like Lord of the Rings and an sf movie like Independence Day, and expect them to appeal to the same audiences. Yes, I understand the slightly different point you were making in your paper, and which I also agree with. I was just trying to link your point about different mythologies with the wider one about not getting to hung up on the difference between SF and fantasy in general (or indeed horror as well, for that matter).